Tommy Aitchison (right), reminiscing with Austin (Cheesey) Hughes in 2005. I was very sad to hear of Tommy Aitchison’s passing last night. Although as a lifelong cricket lover and historian of the local game, he would be the first to admit that at 95, he’d had a “good innings”. I will forever be indebted to Tommy because when I first came to Bermuda as a sports journalist in 1982 he was a generous and invaluable source and guide to Bermuda cricket at a time when the Bermuda Cricket Board of Control was a complete shambles in terms of results and statistics. In a pre-internet age and little written history of Bermuda sports available then, Tommy was a godsend to an expat reporter. Were it not for his painstaking – and voluntary – efforts, many of the Cup Match and County Cup records would simply never have been recorded or preserved. Incredibly, he compiled these from scratch twice because his original stats, left with a colleague for safe-keeping when Tommy moved to the US for 20 years, were thrown away. 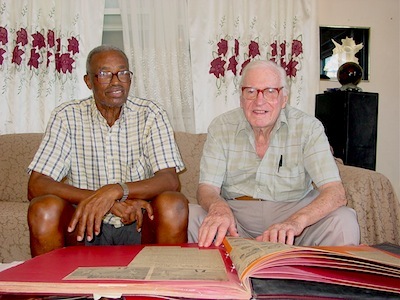 It was through Tommy’s enthusiastic recollections that I first learned about the exploits of Bermudian cricketing legends like Alma (Champ) Hunt, Nigel (Chopper) Hazel, and Clarence (Tuppence) Parfitt, that formed the basis of many articles I wrote over the years as sports editor of the Mid-Ocean News (Tommy had also been its sports editor, back in the days when it was an afternoon daily). We worked on many cricket annuals and projects together over the years and remained good friends. In 2005 I was privileged to edit and produce the publication he said he was most proud of, A True Bermudian Champion, a tribute to the great all-rounder Austin (Cheesy) Hughes. Tommy’s journalism was sometimes criticised, with some justification, because he rarely wrote anything bad about anyone – even if they deserved it. But that was just Tommy. Whether he was writing about cricket, his beloved late wife Lois, or his former wartime army colleagues, whose obituaries he would diligently produce for The Royal Gazette, he always looked for the positive in everything. And he never asked for a cent. I remember him being taken aback when I first asked him to write an article for RG Magazine and insisted that he got paid for it! Tommy’s writing and gentlemanly good humour may now seem from another era but that’s what made him so beloved. And I for one shall miss him dearly.